This time, from a student in the School of Medicine. A Feinberg School of Medicine student is suing Northwestern under Title IX saying the school responded with “deliberate indifference” after he reported he was sexually harassed by a professor. A federal judge ruled last week that the student can move forward with his Title IX lawsuit against the University. His lawyer confirmed Friday that he will do so. Judge Sara L. Ellis ruled Aug. 6 that the medical student can make his case that the University retaliated against him and did not respond as rapidly or as strongly to his grievances as it has to similar complaints filed by female students. Ellis dismissed the student’s allegation that the University responded inadequately to his sexual harassment complaint. The student says a Feinberg microbiology and pathology professor sexually harassed him and later retaliated against him after the student rejected his advances by assigning him poor grades, opposing his application to a fellowship and directing others to discontinue a promised scholarship, according to the suit. 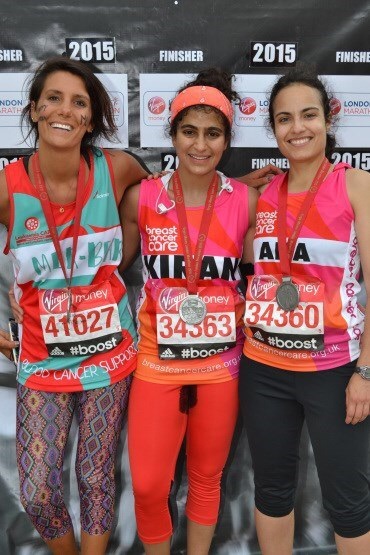 The picture to the left is of Kiran Gandhi, a drummer for M.I.A., who ran the recent London Marathon after having started her period. She did not use a tampon. One result is the stain between her legs. Another is a lot of outrage and accusations. Her account of her motives is on her blog. There are a lot of issues that surround menstruation. One set of issues she wants addressed more widely is the shame many women feel about menstruating. Another is the fact that many women in the world do not have access to products that can in some way contain the blood. She also thought she would be compromising her health choices in order to make people more comfortable, which doesn’t sound like a great idea. So what do you think? For my own sake I have the uneasy feeling as I put this post up that the sky might come crashing down on my head.